The economics background investors need to interpret global economic news distilled to the essential elements: A tool of choice for investment decision-makers. 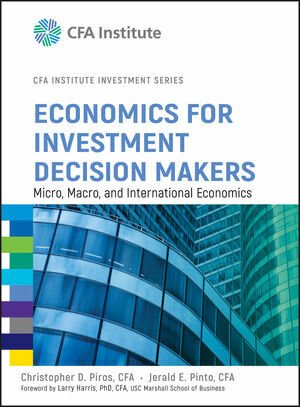 Written by a distinguished academics and practitioners selected and guided by CFA Institute, the world’s largest association of finance professionals, Economics for Investment Decision Makers is unique in presenting microeconomics and macroeconomics with relevance to investors and investment analysts constantly in mind. The selection of fundamental topics is comprehensive, while coverage of topics such as international trade, foreign exchange markets, and currency exchange rate forecasting reflects global perspectives of pressing investor importance. CHRISTOPHER D. PIROS, PHD, CFA, is the Managing Director of Investment Strategy and Chairman of the Investment Policy Committee at Hawthorn, a member of the PNC Financial Services Group, Inc., which is dedicated to serving the needs of individuals and families with investable assets in excess of $20 million. Prior to joining PNC, Mr. Piros served on the team responsible for the curriculum underlying the Chartered Financial Analyst® designation. He also has served as Director of Investment Strategy & Portfolio Management at Prudential Investments LLC, the wealth management services arm of Prudential Financial. And he was a global fixed-income portfolio manager and head of fixed-income quantitative analysis at MFS Investment Management. JERALD E. PINTO, PHD, CFA, is Director, Curriculum Projects, in the education division of the CFA Institute. Prior to joining CFA Institute, he consulted with corporations, foundations, and partnerships in investment planning, portfolio analysis, valuation, and quantitative analysis. Pinto also worked in the investment and banking industries in New York, and taught finance at NYU Stern School of Business. He holds an MBA from Baruch College, a PhD in finance from the Stern School, and is a member of CFA Virginia. CFA INSTITUTE is a global, not-for-profit organization comprising the world's largest association of investment professionals. With over 100,000 members, and regional societies around the world, CFA Institute is dedicated to developing and promoting the highest educational, ethical, and professional standards in the investment industry. CFA Institute offers a range of educational and career resources, including the Chartered Financial Analyst (CFA) and the Certificate in Investment Performance Measurement (CIPM) designations, and is a leading voice on global issues of fairness, market efficiency, and investor protection.